Community Organizing and Social Welfare? Seoul The exciting goal set by the Mayor and the City of Seoul was to increase the utilization of community organizing methodology from 5% to 20% in its social welfare delivery system in order to both increase services and sustainability through its “community welfare centers.” Visiting some of their model projects before the Seoul International Welfare Forum 2012 gave me a much clearer view of the task at hand than I had when I was preparing my remarks. It was clearer, once we were on the ground, that the real mission for the Seoul Welfare Foundation and the proposed 200+ pilots for the next year was probably how to increase the level of “social enterprises” as a tool for delivering welfare objectives. The colleagues at the dais spoke about their work in various countries as well, some of which was undoubtedly responsive to conference’s intentions, but in other cases may have been off the mark, and “lost in translation,” as they may have realized from our field visits as well. My fellow keynoter, Ed Shurna, told the story of the great victory in Chicago to block an arrogant and unresponsive stadium construction, and we had heard of efforts in the community welfare centers to protect the environment and campaign against intrusive developments, but was this really what these governmental centers were willing to embrace? Both Ed and I certainly lobbied aggressively for the development of strong, autonomous organizations, but we were also both clear that that would take training, supervision, and development. A dynamic sister from Indonesia who is on the cutting edge of aligning what may seem to some as a contradiction, Muslim feminism, was stirring in her remarks, and we had visited a coffeehouse and alternative space developed by a community feminist that was categorically embraced by the community welfare center. Would there be more of this in the future? Other speakers questioned the value of institutions in delivering these services from case studies in Japan or advocated various savings schemes to provide more social “security” in the Thailand experience. Are these movements away from any “state” responsibility for on-going delivery of support progressive steps at poverty reduction or a more subtle embracing of neo-liberalism? 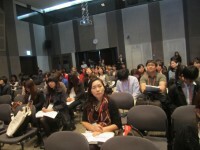 Examples of voluntary efforts in Seoul and Busan, a large city in the south of Korea, demonstrated robust voluntarism and support of cooperative endeavors. Likely the community welfare centers were embracing this notion of social enterprises more than anything else, but how can we scale and expand these efforts through wider, mass community organizing techniques so that these are not one-off, precious pilots? A good forum raises as many questions perhaps as answers, so as we pulled out of the hotel and headed for the airport, we could at least me confident that we had left our new friends with a lot to talk about in the coming months and year until their next forum. 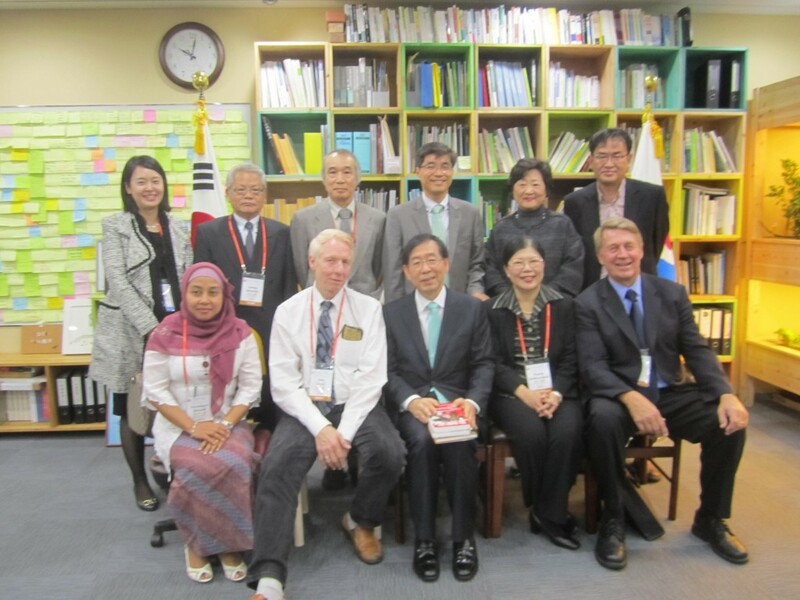 Seoul The Mayor of Seoul, Won Son Park, is a widely recognized progressive, former human rights lawyer, and as he pointedly mentioned to me, “an activist.” As speakers at the afternoon conference, we were meeting with him early in the morning along with the leadership of the Seoul Welfare Foundation which was sponsoring the Seoul International Welfare Forum 2012 along with Hyowoo Na, director of Asian Bridge, an ACORN International’s partner in Korea. The meeting was in his office of course in the super modern, space age City Hall. The Mayor was plain spoken and gracious. His desk was stacked 3 feet high with reports and paperwork. A set of slanting, crooked shelves behind his desk held yet more reports. 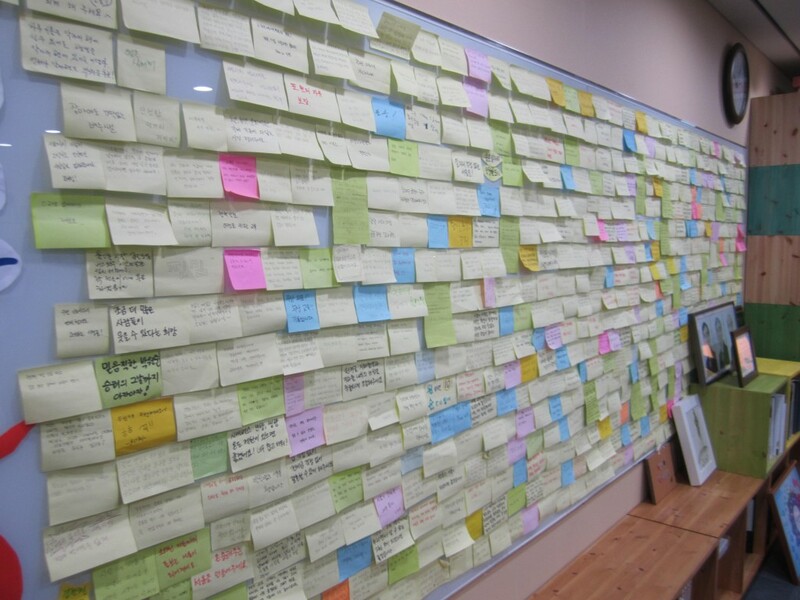 More interestingly the back wall was filled with post-it notes. We asked about his rainbow of notes as we left and it developed that he was known here for collecting comments from citizens about improvements for the city. He was careful to point out to all of us that the citizens were the “boss” in Seoul. I told him when my turn came that in the USA we had a president who had been a community organizer, but seemed to have no concept what they might mean, so it was a pleasure to meet a mayor that actually cared about community organizing. The welfare conference theme was “Community Organization for Sustainable Welfare System” and Ed Shurna of the Chicago Coalition for the Homeless and myself were both giving keynote addresses with other speakers from Indonesia, Thailand, Japan, and Korea on the program. Ed, a friend and comrade, was tasked to give some sense of the history of community organizing from Alinsky forward. My topic focused on the stated goal of the city and the welfare foundation to deliver 20% of their services “using community organization methods.” Ed had definitely drawn the easier straw, since weeks ago, I had no clear view of what the 85 community welfare centers might have to do with welfare. After several days immersed in the program, this was also not “welfare as we knew it” in the sense of cash payments, benefits, eligibility, and needs tests. This was “social welfare” in the broader terms, but they were also modeling social enterprise. Talking to a visiting professor from Sweden, it seems the city was “broke as a joke.” It could have meant that they were looking for “sustainable” welfare in order to transfer the costs to citizens. Such a framework would explain the field visits the previous day better. We’ll talk more of all of this, but the Mayor was without doubt the real thing, so it was hard not to be optimistic even in fact of concerns.